BitCasino.io Review (2019) - Now 100% bonus up to 1 BTC! BitCasino.io is a pioneer in cryptocasino field, as the casino is the first licensed Bitcoin casino in the world. 1456 casino games Join now! BitCasino.io offers solid deposit bonuses and a considerable selection of games in cryptocurrency casinos. There are over 1200 games to choose from. The customer support is available 24/7 via the live chat. You can gamble with Bitcoin and Ethereum. BitCasino.io lobby works quite fast and is crisp, clear and informative. BitCasino.io is the first licensed Bitcoin casino in the world. BitCasino.io belongs to Coin Gaming group and the casino was founded in 2013. The casino offers over 1400 casino games to choose from including many kinds of Bitcoin slot, table games and live dealer games. Casino software is brought to the casino by 24 different casino game providers like QuickFire, Pragmatic Play and Ezugi. BitCasino supports 3 cryptocurrencies: Bitcoin (BTC), Ethereum (ETH) and quite special sports related coin called All Sports Coin (SOC). The lobby operates very quickly and is informative and easy to navigate. Graphical outlook is very plain and clear in a good way. General info and promotion terms are easy to find which is great. This is not obvious in all the cryptocurrency casinos out there. BitCasino is also very active on BitcoinTalk.org since June 2018. Support is also top notch, there is 24/7 live chat available through the website. You can also fill in a web form and you can get the answer via email. BitCasino is licensed and regulated by the Government of Curacao (license no: 1668/JAZ). BitCasino Bonus Codes: No BitCasino bonus code is needed to get the bonuses. Just click the links from this site and activate the bonuses from your account before depositing. BitCasino.io delivers you also a VIP Program. When you become a VIP you unravel the way to a personalised casino experience with many prizes. You can also have you dedicated VIP Manager who helps you with all the things and questions you need. Getting to this exclusive club is by invitation only in BitCasino. 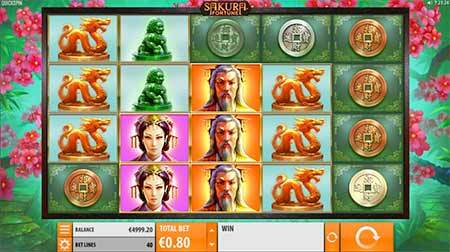 Sakura Fortune Bitcoin slot game by Quickfire. BitCasino has pretty good deposit and reload bonuses. Here are the bonuses explained shortly. Before you deposit, make sure to go to “My bonuses” and click enable if the bonus isn’t active yet. A reload bonus is always 25% up to 1 BTC. So you can get a reload bonus on each and every deposit you make, up to 5 times a day. First make sure to enable the reload bonus from “My bonuses”. After you have enabled the bonus, make a deposit and the bonus will be credited to your balance automatically. 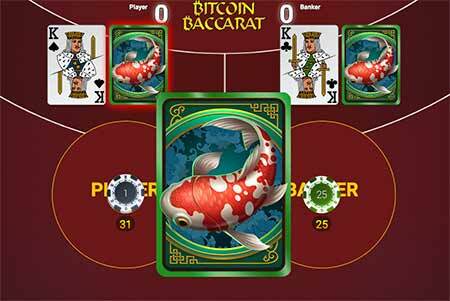 Satoshi Bitcoin Blackjack in BitCasino.io by Onetouch game provider. No bonus codes are needed to get the deposit bonus. Just enable the bonus from “My bonuses” in your account. At the moment BitCasino doesn’t offer any free spins along with the deposit bonuses. However the casino offers a lot of free spins deals for existing customer via email promotions. So follow your email to get some free benefits. Casino Games include all the popular games like blackjack, video slots, jackpot slots, table games like Baccarat, Craps, Russian poker or Casino Hold’em. Video Poker includes all the famous poker games like Deuces Wild or Joker Poker. There are over 1400 Bitcoin casino games to choose from so the selection is quite good indeed! The selection is made of 24 high quality software providers: Evolution, OneTouch, Quickfire, Yggdrasil, Red Tiger, Asia Gaming, NetEnt, Pragmatic Play, TGC, Winners Lottery, Gameart, PGSoft, Booongo, Blueprint, Realistic, Lotus Gaming, Ezugi, Slotmotion, Betsoft, Quickspin, Booming Games, Play’n Go, Endorphina and Leander. 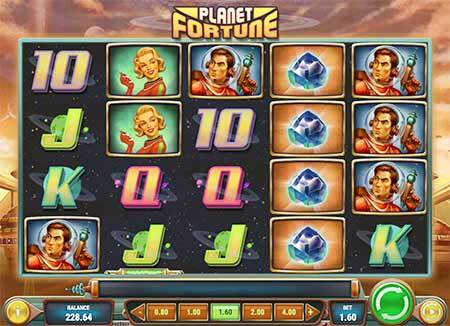 Really cool retro 60’s space Bitcoin slot game Planet Fortune from Play’n Go. There is also about 25 different versions of Roulette and 50 versions of Blackjack so there is a lot of table games to choose from. In overall, the game selection in BitCasino is huge! Players from USA, UK and Australia are not accepted. Here are the most important withdrawal and bonus terms and wagering requirements. Please read the full terms from BitCasino.io homepage. Some things found from the BitCasino withdrawal terms and conditions. 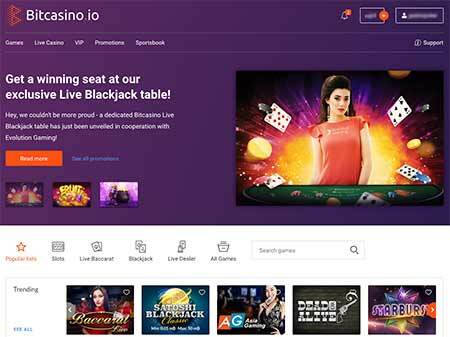 BitCasino.io is a pioneer in cryptocurrency casino field, as the casino is the first licensed Bitcoin Casino in the world. BitCasino offers solid deposit bonuses and a considerable selection of games in cryptocurrency casinos. There are over 1400 games to choose from. Also the deposit bonuses have quite low wagering requirements. You must wager 35x in first deposit bonus and 30x in second deposit bonus. You can also get 25% reload bonuses every day up to 5 times / day with only 30x wagering requirement. The customer support is available 24/7 via the live chat. BitCasino supports natively Bitcoins, Ethereum and All Sports Coin. In conclusion BitCasino is a fast working and fluent casino with strong background. We definitely recommend you to try the casino out and please let us know what you like! Your opinion about BitCasino.io? Please share your thoughts and experiences about this casino below. 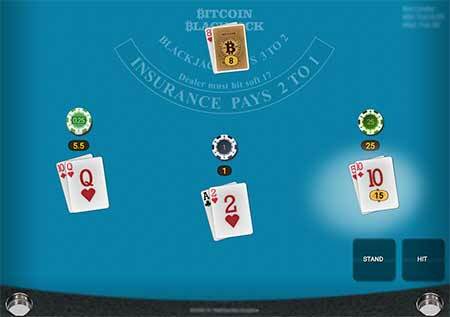 Or if you want, go here to see more Bitcoin casino reviews.